Better Bouquets. 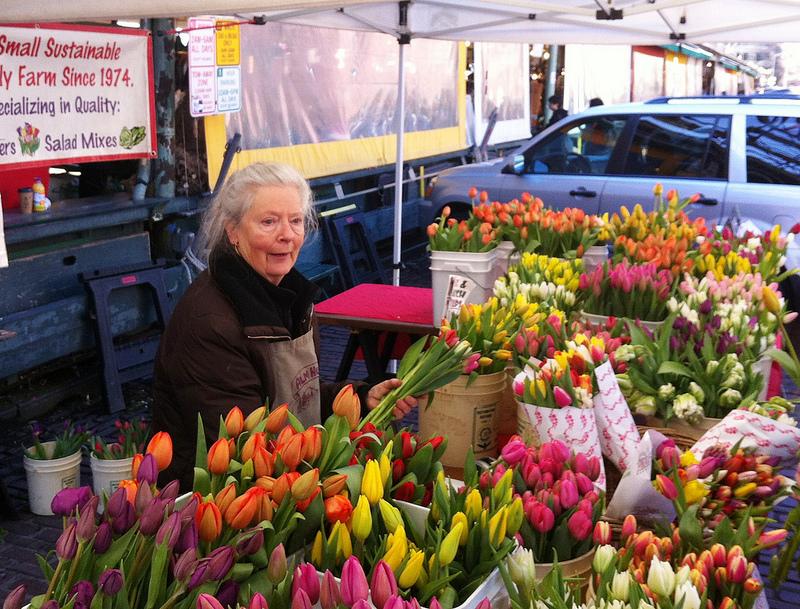 Tulip flower farmer Gretchen Hoyt, from Alm Hill Farms in Everson, Washington. Photo courtesy of Debra Prinzing. West Coast editor Julie Chai reports on the floral answer to eating locally, with insights from Debra Prinzing, the movement’s trailblazing pioneer and author of seven books, including “The Abundant Garden,” “The 50-mile Bouquet,” and, most recently, “Slow Flowers,” a DIY design guide. If you like knowing where your produce comes from and prefer to buy local, you’re in luck: These days, most veggies and fruit found in grocery stores are labeled with their origin so you know exactly how far they’ve traveled. And if you shop at a farmer’s market, it’s easy to find out where your farmer grows. But if you buy cut flowers, it’s a completely different story. Very few bouquets are labeled with where they’re from and if they’re not, chances are they’re grown someplace very far away. In fact, according to the Association of Specialty Cut Flower Growers, about 80% of cut flowers sold in the U.S. are imported from places including Colombia, Ecuador, the Netherlands, and Israel. And that raises all the same concerns as imported produce: uncertain environmental and labor regulations where the flowers are grown, the possibility that what you buy might be laden with pesticides, and of course a massive carbon footprint that’s attached to the blooms’ journey on trucks and jets and more trucks before getting to you. 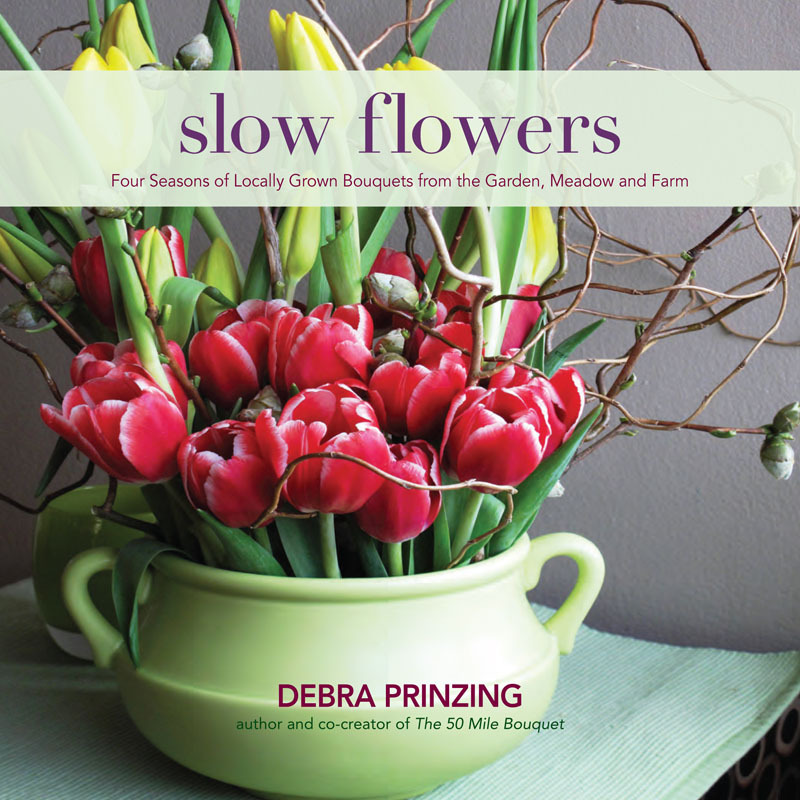 Debra Prinzing, local flower advocate and author of Slow Flowers: Four Seasons of Locally Grown Bouquets from the Garden, Meadow and Farm and the The 50 Mile Bouquet: Seasonal, Local and Sustainable Flowers, is working to make domestic blooms more widely available. For years, she’s been writing about the benefits of choosing bouquets grown nearby, including reduced environmental impact and supporting your regional economy. She also gives lectures around the country and offers consumers ways they can help like telling retailers to carry locally grown choices, requesting that their CSAs offer flowers, and asking florists to source domestic material. Prinzing’s latest book showcases bouquets of seasonal blooms for every week of the year, made from homegrown blooms along with those from local markets and farms. Photo by Debra Prinzing. Slowly but surely, she says, the industry is starting to change: Growers in some regions including parts of California, Washington, and Texas are making an independent effort to label their goods. 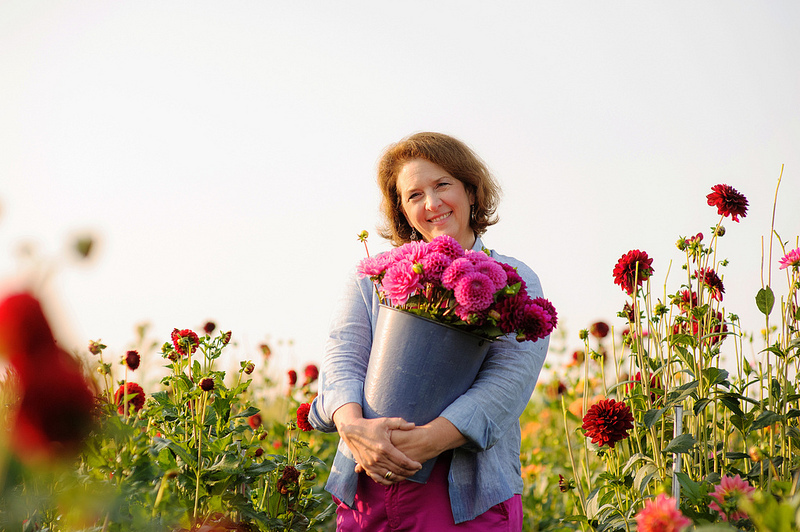 Progressive floral designers are actively seeking relationships with local farmers. Even national flower delivery services are getting on board—companies like California Organic Flowers offer blooms 12 months of year, and though they may not be near you, their domestically and organically grown bouquets are still a better alternative to imports. You can also find a selection of growers, by type of flower or state, in the Association of Specialty Cut Flower Growers’ searchable buyer’s guide. 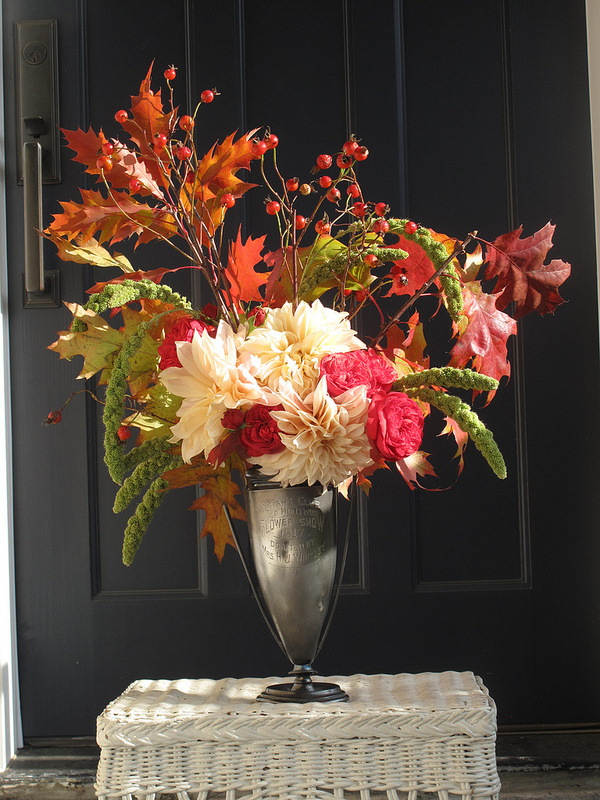 An autumn bouquet of roses, dahlias, millet, oak foliage, and rose hips designed by Prinzing. Photo courtesy of Debra Prinzing. 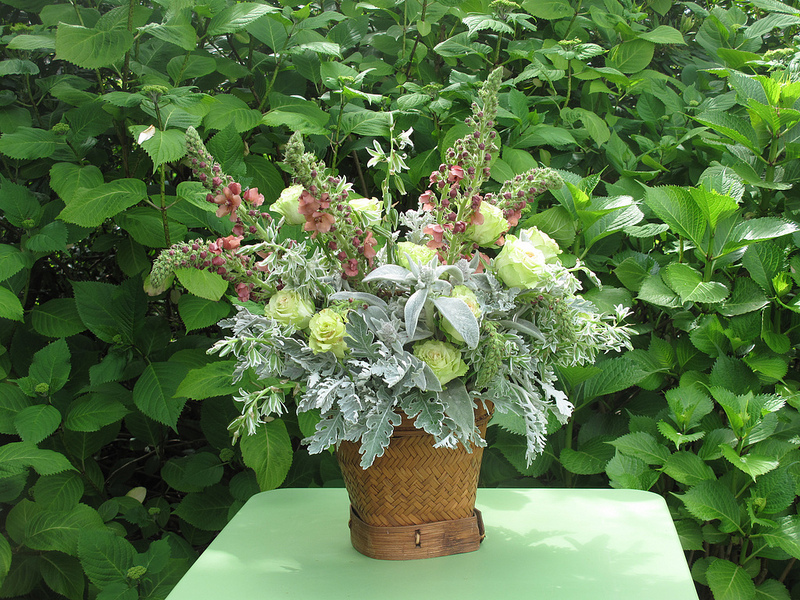 A spring bouquet Prinzing created with dusty miller, lamb’s ears, roses, star of Bethlehem, and verbascum. Photo courtesy of Debra Prinzing. Of course, Prinzing urges us to always think about what floral material we can grow in our own backyards, and ask generous neighbors if you can harvest from their plots. While you might initially feel unsure about how to create bouquets from less common materials, what’s in season will help you come up with new combinations that you simply wouldn’t have thought of if you’d relied on the same familiar, and always available, stems. “I think you’ll surprise yourself,” Prinzing says. For more information about Debra Prinzing, see debraprinzing.com. This entry was posted in Flowers, Uncategorized and tagged bouquets, cut flowers, Debra Prinzing, floral, flowers, fresh flowers, garden, gardening, Julie Chai, local flowers, regional flowers, Slow Flowers, Sunset magazine. Bookmark the permalink. Love this! I’ve often thought when my lavender is in bloom, that it is far too much for me even to harvest and someone surely could use some in a bouquet. But who? I usually give lots to a daughter-in-law who loves it, and to a local jeweler, whose wife loves it and shows it in their store. I noticed the fall arrangement, above, seems to be in a re-cycled urn. I love that, too. How many cherished pieces lie unused in local resale shops, available for a pittance! That is far better than a dumb plastic look-alike we often find under our purchased flowers. What great ideas you have opened my mind to embrace! Thanks!